The Everest Panorama Trek is one of our favourite treks and we’d be delighted to help you explore this impressive region in Nepal. 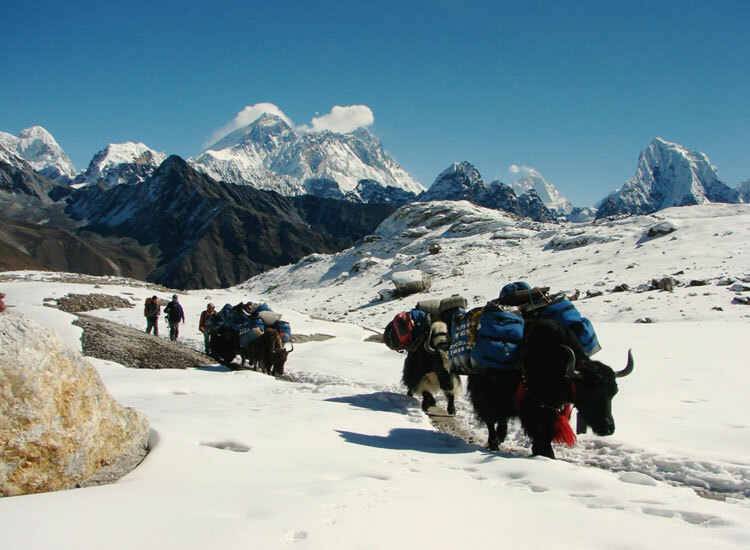 The Everest View Trek is a pleasant 12 day journey into the Everest region. It gives you a remarkable view of Everest and Lhotse and introduces you to the Everest region without the strains of very high altitude and with a much lower time requirement. 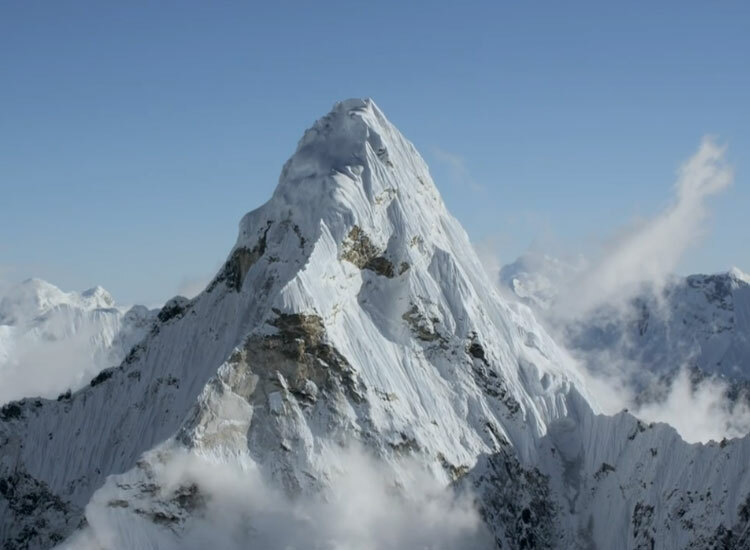 Apart from Everest and Lhotse, the trip also offers stunning views of famous peaks like Thamserku, Ama Dablam, Nuptse and Tawache, to only name a few. 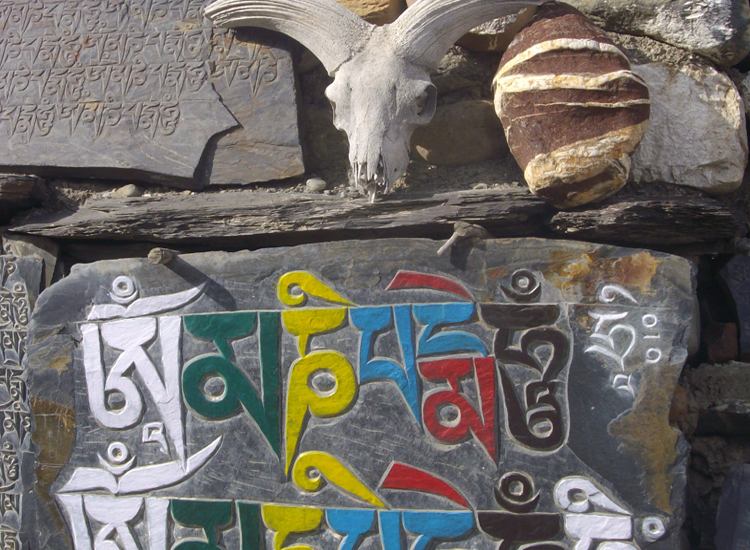 You will also have the opportunity to explore Sherpa culture, picturesque villages, and one of the highest monasteries – the famous Tengboche monastery at (4100m / 12661 ft). Despite the short time, there are plenty of opportunities to gather memories of a lifetime (and we’re only exaggerating just a little bit). This trek is physically less demanding than other treks in the region and a good level of fitness is sufficient to start your journey. The Everest view trek begins like most treks in the region with a scenic flight to Lukla from Kathmandu. Lukla is the entry point to the Everest region. We then continue our trek through the Sagarmatha National Park which at this altitude offers a pleasant climate with by pine forests and rhododendrons. If you are lucky, you’ll also be able to spot some of the local wildlife. 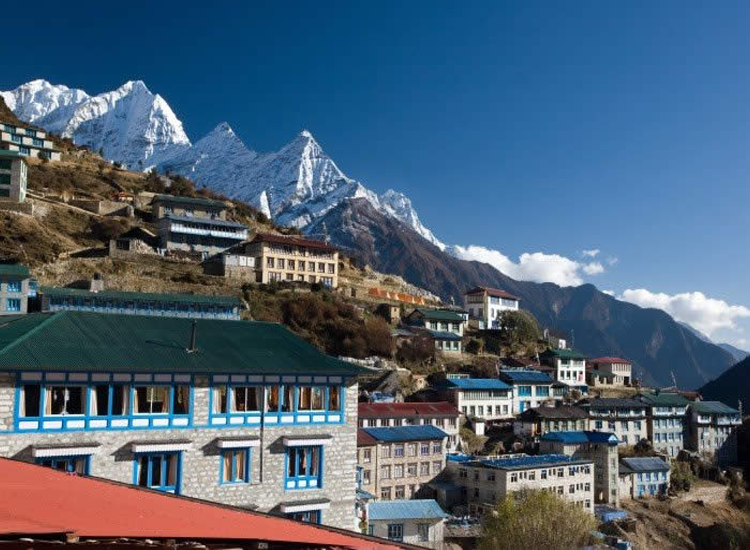 We continue to Namche Bazaar, a key village of the region as it sits at the entry point to the higher valleys. 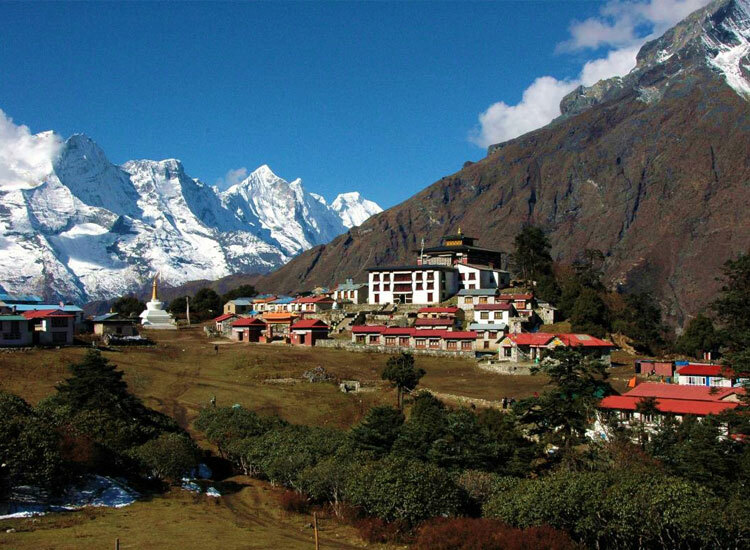 We make our way to Tengboche where you can observe the overwhelming beauty of Mt. Everest (8848m.) and its neighbouring peaks. We fly to Lukla. From here we walk northwards up the valley of the Dudh Kosi (Milk River). We descend from the small plateau, down into the forested valley. After a pleasant hike (3-4h) we reach our destination:Phakding (2,652m). From here we follow the Dudh Kosi northwards. The trail will take us through magnificent forests of rhododendron, giant fir and magnolia. From Jorsale (2,805m), we cross the west fork of the river, the Bhote Kosi, and start the steep climb to Namche Bazaar. The trail offers us stunning views of nearby 6000m peaks. After about 5hrs we reach the Sherpa village and gateway to Everest Base Camp, Namche Bazaar (3440m). Time for a cup of tea to celebrate today’s achievement. The day begins with a steep ascent towards Zarog and we continue to the famous Sherpa villages of Khumjung and Kunde (via Shyangboche). We’ll visit the Hillary Memorial Viewpoint, his family memorial chortens, the Hillary School and the atmospheric Buddhist temple in Kunde. 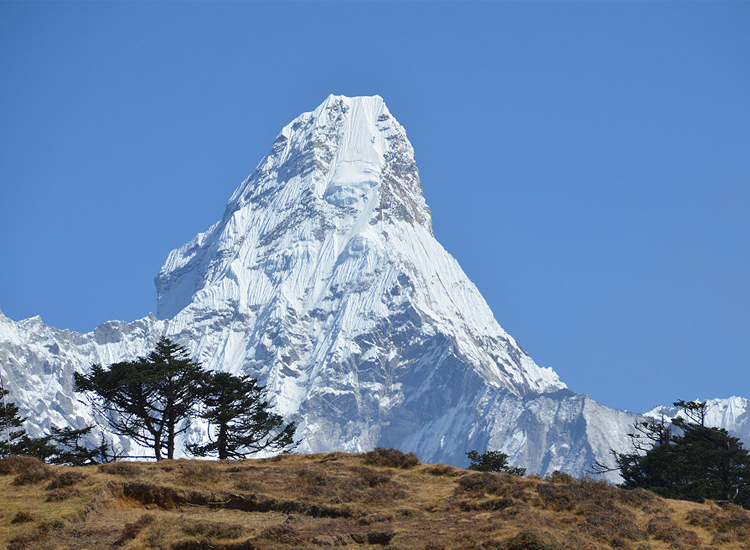 The trip offers us wonderful views of Khumbila,AmaDablam,andThamserkhu. 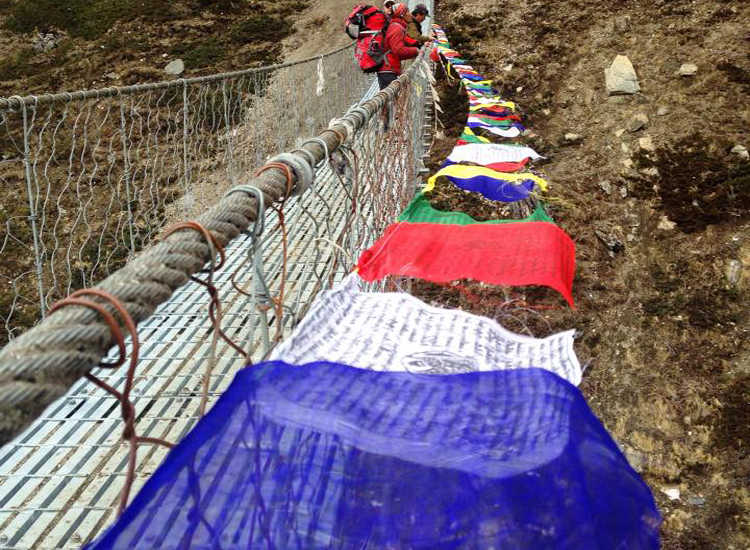 We follow the trail out of Namche across the Yak hillsides to the Mong La. From here we descend and cross the Dudh Koshi river. Trekking poles might be particularly useful today. We’ll be able to enjoy views of Mt. Everest, Ama Dablam, Kang Taiga, Thamserkhu and Taboche as well as other stunning peaks of the region. 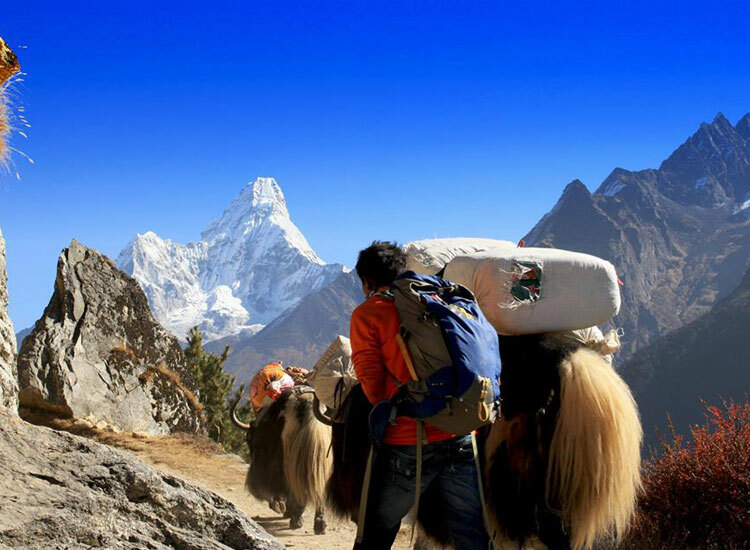 We climb some narrow paths in the pursuit of more impressive views of Everest and Ama Dablam as well as the entire valley. In the afternoon, we’ll relax over some tea and coffee. 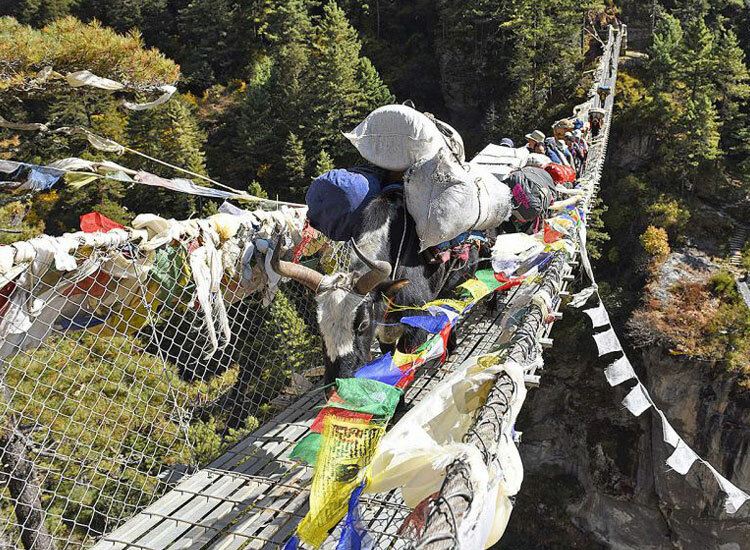 The day begins with a pleasant walk and the crossing of the Imja Khola.We’ll pass by a very popular stupa. From here we then follow a steep section to Tengboche. We’ll visit the famous monastery, the museum and participate with monks during their prayers. Tengboche marks the high point of our trip. 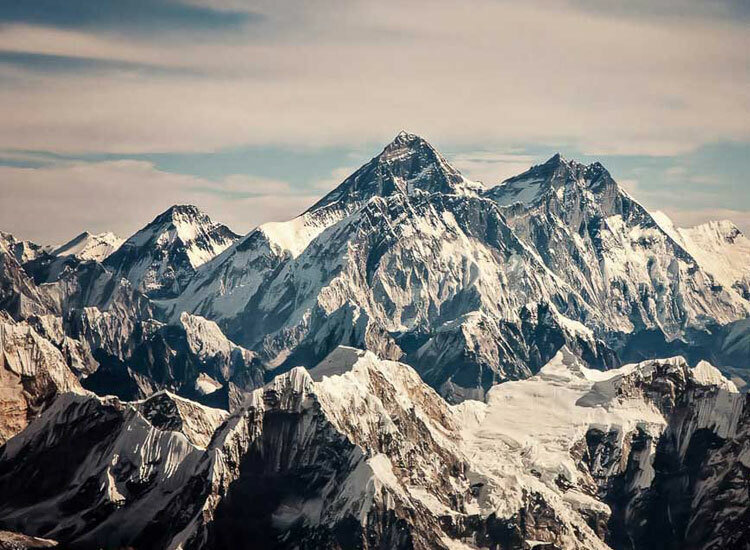 At this point, you can extend the trip and continue to the Everest Base Camp or if you would like to experience peak climbing, you can climb Island Peak with only a few additional days necessary. We retrace our steps back to Phunki Thenga and then follow the trail towards Namche Bazaar. We retrace our steps from day 03&04. Although the path is all downhill, the unrelenting slope place a strain on the knees and trekking poles will come in handy. We take frequent stops where we can have a relaxed tea. - Unforeseen expenses not under our control such as flight cancellations or delays, weather related issues, illness during the trek, rescue costs etc. - Any other costs not specifically included. Please feel free to ask if in doubt. The flight from Kathmandu to Lukla significantly reduces the journey time compared to the trek via Jiri (which we also offer). The flight is the shortest and most popular way of gaining access to the region but the mountain weather is notoriously unpredictable and sometimes even during the best part of the season, flights are delayed or postponed for one or more days. Cancellation and the delay of the trip only occur starting and end of the trip during the flight day. In case of the flight cancellation due to bad weather, extra expenses (Airport drop and pick up, extra night in hotel, Guide and porter extra days wages, except the number of days included in the package extra days extension due to flight cancellation or some other reason from individual clients must bear by themselves, etc.) might occurred which are not included in the package and one should ready to bear those expense. We also arrange for a Heli charter from Kathmandu to Lukla or return instead but this adds significant extra cost. While chartering heli because of the flight cancellation, the cost of the fare tickets will be deducted from the heli cost. We highly recommend that you take potential delays into account and allow for a week extra day in Kathmandu. Because of the flight delay, there will be changes in your travel date. Make sure that all the extra expenses occurred due to the unforeseen condition will be bear by your travel insurance company. We plan with one porter per 2 clients. If you require additional support, you can book an additional porter for the trip to lighten your load. A porter carries your bag pack for you and no more (20kg max. They don't often speak any English. They carry two backpacks that they will strap together. But you are strictly prohibited not take advantage of the porter. They are usually very proud people and will attempt to carry things that are just too heavy. Which is not good. You can leave your unnecessary stuffs in Kathmandu your hotel or our office you will not need on the trek. Have a take small personal daypack with you. Your daypack should contain everything you need during the day but keep it as light as possible. Examples: water, some warm clothing, your camera, sunscreen, etc. Note that luggage you hand the porters might not be available to you during the day as they sometimes set their own pace. If you feel like a little luxury before and after your trek, you can upgrade your hotel in Kathmandu to 4*/ 5* category. Tipping is, Since the 1960s when trekking in Nepal was developed, there has been a tradition for groups and independent visitors to tip their crews at the end of a trek. Money and Tipping; it is best to bring a mixture of cash, USD, GBP, CAD, EUR. Ensure you have also small denominations. As a guideline for baseline spending money we suggest USD 8 - 10 per meal in Kathmandu(if you drink or smoke or plan some major shopping this could be higher). You should exchange enough money into Nepalese Rupees to last the entire time of your trek BEFORE leaving Kathmandu. There are no exchange facilities in the villages along the trail but plenty of money changers in KTM.